Beginning 1 January 2020, the International Maritime Organization’s (IMO) new regulations will limit the sulfur content in marine fuels used by ocean-going vessels to 0.5% by volume, a reduction from the previous limit of 3.5%. The change in fuel specification is expected to put upward pressure on diesel margins and modest upward pressure on crude oil prices in late 2019 and early 2020, according to the U.S. Energy Information Administration (EIA). 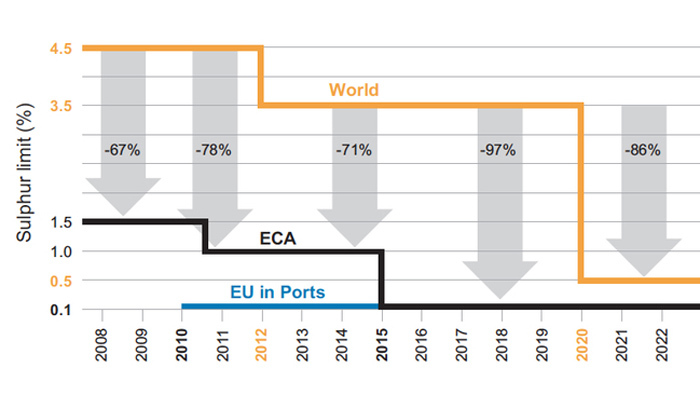 EIA’s analysis indicates that the price effects that result from implementing this new standard will be most acute in 2020 and will diminish over time. Residual oil—the long-chain hydrocarbons remaining after lighter and shorter hydrocarbons such as gasoline and diesel fuel have been separated from crude oil—currently comprises the largest component of marine fuels used by large ocean-going vessels, also known as bunker fuel. Marine vessels account for about 4% of global oil demand. Removing sulfur from residual oils or upgrading them to more valuable lighter products such as diesel fuel and gasoline can be an expensive and capital-intensive process. Refineries have two options with regard to residual oils: invest in more downstream units to upgrade residual oils into more valuable products or process lighter and sweeter crude oils in order to minimize the production of residual oils and the sulfur content therein. EIA forecasts that the implementation of the new IMO fuel specification will widen discounts between light-sweet crude oil and heavy-sour crude oil, while also widening the price spreads between high- and low-sulfur petroleum products. In the January Short-Term Energy Outlook (STEO) forecast, Brent crude oil spot prices increase from an average of USD61 per barrel in 2019 to USD65 per barrel in 2020, with about USD2.50 per barrel of this increase being attributable to higher demand for light-sweet crude oils priced off of Brent. The expected increased premium on low sulfur fuels will likely mean higher diesel fuel refining margins, which EIA forecasts will increase from an average of 43 US cents per gallon in 2018 to 48 US cents per gallon in 2019 and 65 US cents per gallon in 2020. Motor gasoline margins averaged 28 US cents per gallon in 2018 and are expected to increase slightly to an average of 29 US cents per gallon in 2019 and 33 US cents per gallon in 2020. Because of the numerous and diverse set of decision-makers involved in complying with the regulations and the global nature of the regulation, significant uncertainty exists regarding the forecast outcomes of the regulation. On 24 January, EIA will release its Annual Energy Outlook 2019 with projections through 2050, which will reflect the long-term implications of the new sulfur requirements.